I remember the moment I started reading Mark Lawrence work with absolute clarity. Coming upon something extraordinary will do that to you –a song heard for the first time, a view glimpsed through trees, an expression on a lover’s face. I was sitting at my desk in our apartment in Morocco when a submission requiring swift reading popped into my inbox. Outside the sun was hot and bright; but inside a band of marauding raiders were intent on atrocity, fog wreathed the landscape and the dead were rising. And all of this was conveyed in prose so lyrical and precise that it took my breath away. 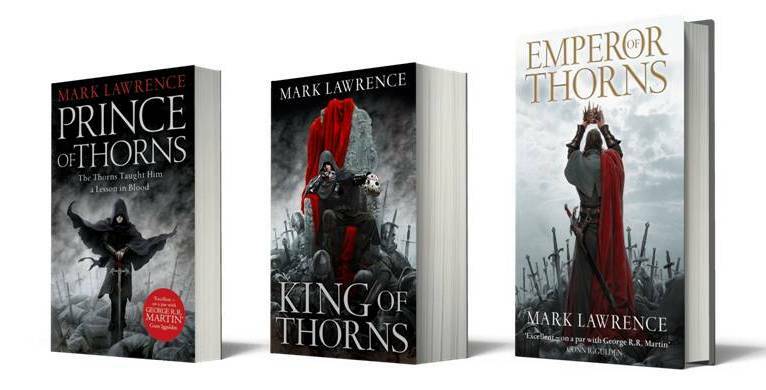 We bought the Broken Empire trilogy – PRINCE OF THORNS, KING OF THORNS and now EMPEROR OF THORNS – within 24 hours of that reading: something of a record in the slow-moving world of corporate publishing, and had to beat off every other UK publisher in the process. And here we are just 3 years later coming up to publication of the final volume. Mark has written a fine blog on the subject of completing this chapter of The Broken Empire books in which he says it has been a journey. And indeed these books will carry you away and subject you to horror and beauty, misery and epiphany. Jorg does not at first appear to be the most appealing of protagonists: a charming but amoral young thug, hardened against the suffering of others to a terrifying degree. But, oh! as the books unfold themselves in their cunning, elegant fashion like some piece of clever origami, we come to see what has made Jorg who and what he is. We come not only to respect him but in the end to root for him; even to love him. That’s a trick not many seasoned novelists could pull off, let alone a debutant in the field. People have compared Mark Lawrence to George RR Martin and Joe Abercrombie. Certainly, there’s an edge to his work that he shares with these two fine writers, a grittiness to the characters and the complex moral universe in which they operate; a way with words and of leavening the grim with laugh-out-loud lines. But there is also something deep and dark lurking in the prose, something that will sink its claws into you as surely as any hook-briar. Some readers have been strident in their negative reaction to the violence, though I hazard to suggest they have rather missed the point. And it’s true: Mark Lawrence will scar your soul. You’ll come away from reading him in an altered state – somewhere between elation and despair. If you haven’t read his work yet, I urge you to do so. But I warn you now: it’s not for the faint-hearted. The journey is shocking. When I read KING OF THORNS I wrote to Mark: ‘This is shaping up to be the most extraordinary work of fantasy I have ever read: because you take such risks’. Those risks pay off brilliantly in EMPEROR OF THORNS. But don’t take my word for it. Read it and see what all the controversy is about.